This tutorial describes the administration screen accessible to Administrators within the WebMail system. 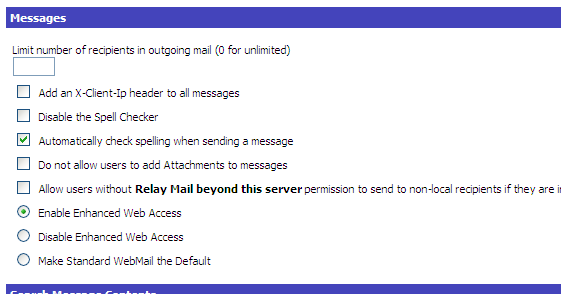 Make sure you have followed Setting up WebMail to enable your webmail service. For each user who will have administration permission, make sure the 'System Administration Privileges' box is checked in the Users' Properties dialog box. Log in to Standard webmail using the Administrator's primary mailbox name, and the administrator's password. Now you are logged on you can send and receive email however we are more interested in the administration page, so click Admin in the top navigation. We recommend administering webmail using Standard webmail - even if you normally use Enhanced for daily activity. You will see a confirmation and access appear in the main webmail menu. Configure default Message Reply text. Each Mailtraq installation can have a domain name, and several domain aliases (for example, you might have registered domain.com and also domain.org or mybiz.com and anotherbiz.com). This dropdown allows you to select the domain name that should be used for all outgoing mail that WebMail users generate. at the Domain Name and Domain Aliases entries. Note: Disable Enhanced Web Access (EWA) is in the Messages section below. Set the ability of Users to change their Passwords dependent on their Password Change privilege in the Console. If checked, this section will enable users to sign themselves up to use the service, even if they are not already listed as a User within the Mailtraq Console. You should create a template user and mailbox within the Mailtraq Console, and select them in the dropdown boxes. Be sure to give them the correct permissions - you would not, for example, want to give every user administration privileges! To prevent abuse you may want to request an email address (separate from this WebMail system), and, if you do, you can set the system to email them at that address with a random password, which they would then have to use to login with. This section provides controls to prevent abuse of the system. You can limit the number of recipients, and you can record the IP address of the machine the user is connecting from. This option is most useful if you are providing a public access service, as this helps trace a user in the case of an abuse complaint. The Administrator can set all User accounts to run the spell checker on sending messages. The user-privilege 'Relay Mail beyond this server' set at the User | Properties dialog in the main Mailtraq Console can be set to control access to the mail service. This setting is used to only allow users to send messages to an address that exists in the address book system. The Administrator can enable or disable Enhanced webmail, and can switch Standard webmail to be the default choice at webmail login. One of the most powerful features of the Mailtraq WebMail system is its support for full-text searches of messages. However as this can be extremely CPU-intensive, you can specify the maximum number of results to return, and the amount of time the search should take - searches which take longer are abandoned. See notes on system requirements. Mailtraq 2.7 and above allow Administrators to allow Users to access their mailslot archives when Archiving has been enabled in the Console. An additional check-box shows at this dialog in that case. It is recommended that you use the AFX Database if you need to search through significant amounts of mail. The Anti-spam Options allow the administrator to control access to the Anti-spam settings in the Users' 'Options' Menu. When you have adjusted the settings for your server, click 'Save Changes'. The Admin can allow Calendars to be published and retrieved by any user with the appropriate credentials using iCalendar. A link appears when viewing the calendar or to-do list.